Lately, I feel like I've been feeling my finiteness hard. My humanness. I have a thousand things I want to explore and to accomplish and to finish and to be... and at the end of the day, I struggle to accept that I have limits. I have boundaries. And this means that I never get as much done as I wish, I never finish things in the time frame I desire, and I never am all I wish I was. Case in point? This table. (Oh, and pretty much everything else in this picture that I have plans for- that door, that wall, that unfinished beam). I started working on this table a month ago, and it's still not done. It almost is. But I thought I'd have it finished in a week. There are always problems I don't anticipate, children who need my help or my attention, other projects that suddenly need my attention, and materials I run out of right in the middle of it all. But the good news is, the only part I have left it to stain and seal the top of the table. Yay! 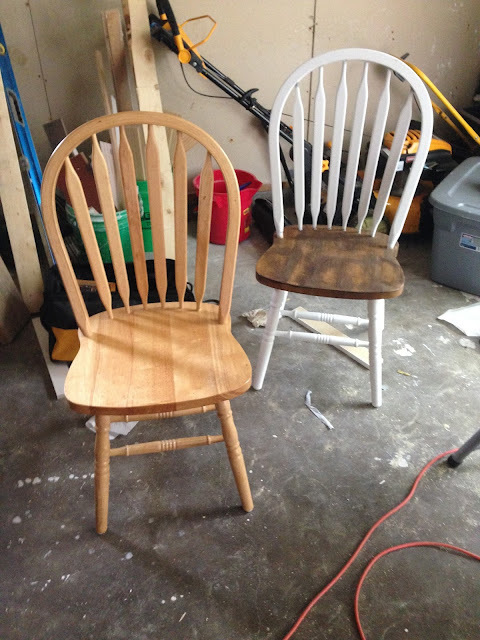 Here are a "before" chair and "after" chair side-by-side so that you can see what I am doing. Basically, I'm taking the plain wood table and chairs and giving them a farmhouse makeover to match the rest of my kitchen. I'm using a dark walnut stain on the seat and table top and white chalk paint on the legs and backs. And here's Sophie, who has made the bench into her table as I work on the real table. I'm so thankful kids know how to go with the flow. Oh, and yay for the barn doors in the background- another project we have finished in the midst of the table makeover! I wish I had more time for this blog too. I'd love to blog every day... or at least once a week... but I'm realizing that I need to accept that I don't have the time for blogging that much, so I come on here when I can and when I have something really pressing on my heart. I wish I was more intentional with my kids. There are always more verses or educational things I wish they knew. I'm getting behind on their Shutterfly books. I wish I made more exciting meals and had more time to cook from scratch. I wish I had my camera with me and ready at every moment. I wish I had more time to read my Bible. I have friends I have been wanting to call and catch up with or drive and meet up with for months. I wish I had all the paintings done that I have in mind for my house and also some for friends and some to sell. And I could keep on wishing forever. But God is teaching me to accept that I am finite. And not only to accept but to embrace this because this is how he created me, and in my finiteness he has entrusted me with great gifts and talents and responsibilities and will allow me to accomplish everything of importance for this day. In all of this, I am learning two important things. One is to be awed at God's infiniteness. He created the world in six days. The whole world in six days. That's enough to blow my mind and throw me on my knees in awe when I'm in the midst of feeling my limitations. But he also is everywhere at any given moment. He can bring new life and paint a rainbow in the sky. He gives each snowflake and each star a unique shape so that no two is identical. And I'm lucky if I get the kids dressed and food made and keep the house in order and then get one layer of paint on one of my projects after the kids go to bed. And to think that I seek to give glory to myself? How absolutely silly and ridiculous that I actually think that I am big stuff. I am not big stuff. God may allow me to do relatively big things, but that is only because He is big stuff and He is far kinder than I deserve. Two is to really seek the Lord in how He wants to use my life. My life. Because I'm so prone to look at all these blogs and instagrams and pinterests and think that I need to live their life. And then everything just gets overwhelming and frustrating. So I've been seeking the Lord as of late... asking Him to give me wisdom in how to use my time for Him. How to prioritize. How to make every moment count and to have few regrets. I don't have it figured out yet, and I don't expect I ever will. But I am learning to be content with giving some things less time (blogging and getting house projects done right away), and I'm learning how to make time for the more important things (Jesus, my family), and I'm learning how to balance the extra time with all the good possibilities that are available. And I'm seeking to embrace this finiteness for all it's worth and to thank God for giving me even this breath because it's 214,740,720 more than I deserve.